Teething, weaning and the occasional sickness are particularly hard times for maintaining your little one’s weight. Some babies bounce back to the healthy weight quite easily, and some need your special care. Here we present to you some superfoods that will help in weight gain for your little one. There can be no food as good for your baby as the breast milk. It is a naturally balanced, easy on the stomach superfood customised for your little one. For very little infants, lots of breast milk is the way to gain healthy weight! 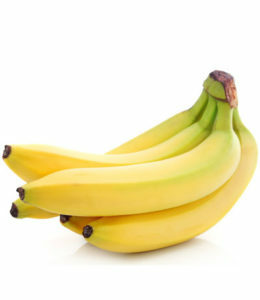 Banana is rich in carbs, potassium, and vitamins with a pleasing taste. It is also readily available and easy to carry, making it a great nutritious snack. You can feed your baby mashed bananas, steamed bananas or blend them into purees and smoothies. Kerala also has a proud tradition of making dried banana powders for infants, which helps weight gain. Homemade ghee is a source of great healthy fats, free of any harmful preservatives and chemicals. You can add ghee to baby porridges, rice, purees and in cooking for a lip-smacking taste and health. Ghee goes well with both sweet and savoury food. Take care to use moderate amounts. Dry Fruits are a good source of energy and calories for the growing little ones. 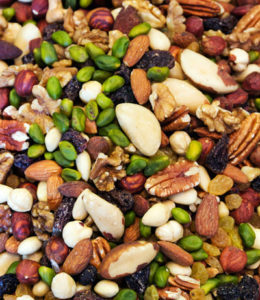 You can powder nuts like almonds, pistachios, walnuts and cashews and give them to your baby. Start in small amounts and increase as your baby grows. Homemade curd and yoghurt are good probiotics loaded with goodness. They help in building a healthy immune system and are easy to digest. You can add curd or yoghurt to salads, rice or make buttermilk for your kid for a healthy weight gain. It is customary in many parts of south India to feed multi-grain porridges to babies. You can mix ragi, rice, wheat, almonds and a few bits of coconut to make a healthy porridge for your baby. For tiny babies, you can soak them overnight, blend and boil the extract with a little water and sugar/salt. For babies older than ten months, you can dry roast and powder grains to cook porridges. 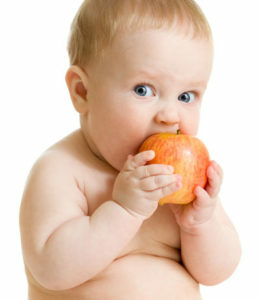 Babies can be fed little amounts of fruits and vegetables every day. Beginning early not only helps their weight gain, but it also provides a dashing variety of flavours and textures in their diet with great nutrition. Fruits like pears, mangoes, apples and apricots, vegetables like pumpkin, carrots, beets and sweet potatoes are very good for babies. 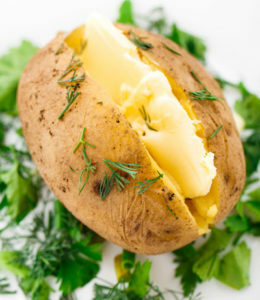 Potatoes are rich in carbohydrates, natural phenols, carotenoids and other vitamins and minerals that help in weight gain. It also has a low key taste that goes well with many recipes. You can add potatoes in curries, soups or gravies you make for your family and then feed only those potatoes to your baby later. Eggs are a wholesome food that helps in good weight gain. The egg yolk can be given to babies from around 7 to 8 months. You can introduce the whites later because they tend to digest slowly and cause allergies commonly. Eggs are versatile – you can make egg rice, pudding, toast, boiled, poached or scrambled eggs for your little one. Fats are good energy sources that help increase your baby’s stamina. They are also the best choice for underweight babies. Avoid salted butter for babies. Too much of butter can be heavy, so feed in moderate amounts. You can add half teaspoon butter in every meal for your baby. You can use it as a spread on sandwiches, rotis, dosas or puris; you can also add butter while cooking. Fish is mostly protein, which comes under bodybuilding food. 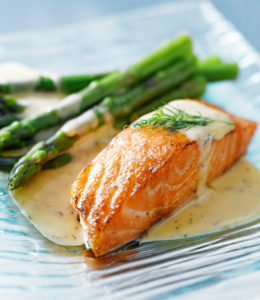 Adequate amounts of fish is a must for all children, whether underweight or overweight. The rich omega three fatty acids and vitamin D are a treasure for the growing ones. Avoid buying canned fish and fish containing mercury for your little ones. Also, remember to give babies lots of water throughout the day when they have fish. Cow’s milk is a popular food that helps maintain a good weight. You can give two glasses of milk every day once the baby is one year old. If your baby is not fond of plain milk, you can make smoothies and milkshakes for your little one. Meats are a good option for healthy weight gain in babies. Meats are rich in fat, protein, amino acids, zinc, iron, and selenium. You can add a serving of meat for your baby every day. Some meats may cause constipation, so compensate with some fibres and lots of water/juices in the diet. The journey of weight gain is different for every child – some babies stay lean, and some stay chubby. The key is to focus on whether they are or not active and healthy overall. Keep an eye on the number of wet nappies in infants and developmental milestones in older babies. A graceful balance of diet is the way to go for all!